Rediff.com » Getahead » Hilsa for PM Singh? Share your recipes! Hilsa for PM Singh? Share your recipes! Prime Minister Manmohan Singh said he would break his 'vegetarian vow' if he was served Hilsa fish during his two-day trip to Bangladesh. Have a recipe you can recommend to his chef? Send it in! One of the many things that a Bengali would swear by, the Hilsa is one of West Bengal's greatest contributions to Indian cuisine. The tastiest Hilsa in India comes from the rivers in Bangladesh so it's quite understandable that Prime Minister Singh is willing to give up his vegetarianism for one meal of the delicious fish. Hilsa, which holds a place of pride in feasts on special auspicious days, can be prepared in many different ways. And just as there are ways to eat it, there is a special way to eat it too. For now though we are inviting you, our readers, to share with us the tastiest Hilsa recipes you've come across! 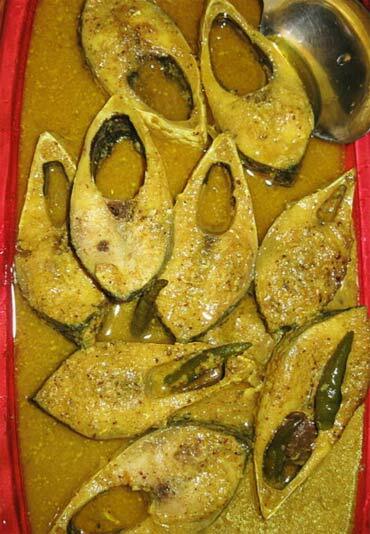 All you have to do is send us an email (Subject: Hilsa recipes) with the detailed recipe and preferably a picture of the dish to go accompany it and we will publish the best and the most interesting recipes right here on rediff.com! Puran, Alu Wadi and more Ganesha recipes! Enjoy these lip-smacking Eid specialities!